Cologne - The 2015/16 Bundesliga season is only three matchdays old, but a number of players have already made a splash at their new clubs. SV Werder Bremen needed a man to step into the boots of Franco Di Santo this term, and in Anthony Ujah it appears they have found the perfect replacement. From Ailton to Claudio Pizarro up to Di Santo, the north Germany side have embraced a long line of foreign goalscorers, and Ujah has wasted no time in endearing himself to his new admirers. With a goal against Hertha Berlin and an assist against Borussia Mönchengladbach - not to mention finding the net on his competitive debut in the cup - he has already underlined his value, with his admirable work ethic and ability to bring team-mates into play not going unnoticed either. "Ujah's our most important player," admitted coach Viktor Skripnik. "Now we're all just waiting for the next goal from him." He surely does not have long to wait. Lars Stindl was one of the most prolific playmakers in the Bundesliga last season, practically saving Hannover 96 from relegation single-handedly. A move to Borussia Mönchengladbach has only served to enhance his already lofty status, and while there may not have been much to smile about at Gladbach so far this season, Stindl has supplied some sunshine moments. He is playing in a slightly deeper role in the Foals midfielder than he did in2014/15, but that has not dulled his goalscoring instincts so far, with a goal and an assist in the Bundesliga, and two goals plus one more provided in the DFB Cup already in his account. "Everything's so easy when you have a team-mate like Lars," says Ibrahima Traore. 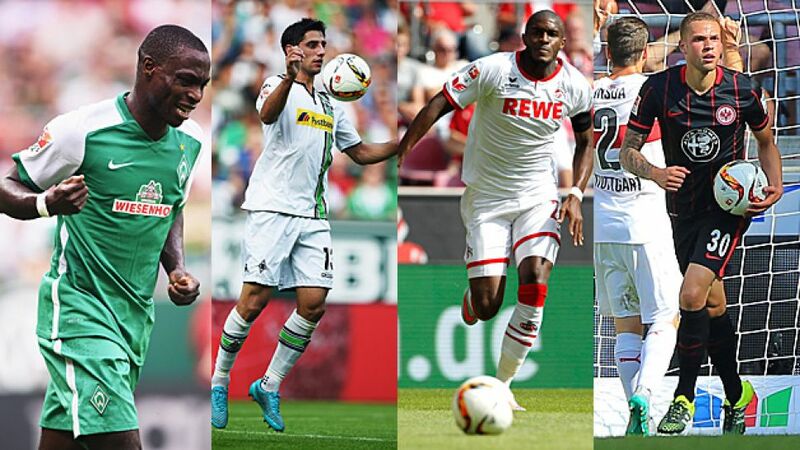 As debuts go, Anthony Modeste's for 1. FC Köln was up there among some of the very best. A goal and an assist helped the Billy Goats to a 3-1 win at Stuttgart, and he went on to provide another assist in the 1-1 draw with VfL Wolfsburg. It was hardly surprising, therefore, that the Köln fans unanimously voted him as their best bet to be the club's top scorer (89 per cent) and player (31 per cent) of the season. That poll was held even before Modeste scored his second goal for the club in the 2-1 win over Hamburger SV, meaning he has now been involved in seven goal in his four appearances. After a couple of years getting to know the Bundesliga, the 27-year-old now appears to be delivering the goods regularly. Not even Eintracht Frankfurt would have thought that Luc Castaignos would make as big an impact as he has for the Hessian club. Signed to add more variety to the Eagles' attack, he has exceeded expectations with two goals and an assist in the first three games of the season, helping Frankfurt remain prolific even without the injured Alexander Meier. Meier famously became the first Frankfurt player since the great Anthony Yeboah in 1993/94 to become Bundesliga top scorer, and who knows if they do not have another potential Golden Boot winner among their ranks this season. "The lad doesn't even realise for himself what he is capable of," says Frankfurt coach Armin Veh.